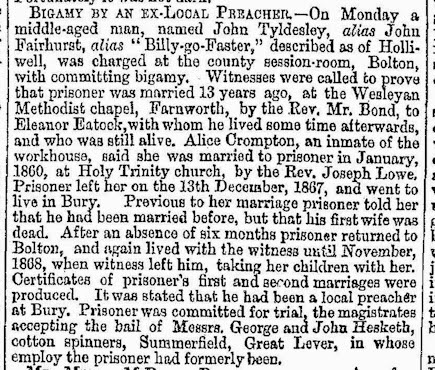 On Monday a middle-aged man, named John Tyldesley, alias John Fairhurst, alias "Billy-go-Faster," described as of Holliwell, was charged at the county session-room, Bolton, with committing bigamy. 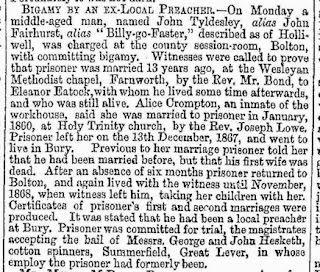 Witnesses were called to prove that prisoner was married 13 years ago, at the Wesleyan Methodist chapel, Farnworth, by the Rev. Mr. Bond, to Eleanor Eatock,with whom he lived some time afterwards, and who was still alive. Alice Crompton, an inmate of the workhouse, said she was married to prisoner in January, 1860, at Holy Trinity church, by the Rev. Joseph Lowe. Prisoner left her on the 13th December, 1867, and went to live in Bury. Previous to her marriage prisoner told her that he had been married before, but that his first wife was dead. After an absence of six months prisoner returned to Bolton, and again lived with the witness until November, 1868, when witness left him, taking her children with her. Certificates of prisoner's first and second marriages were produced. It was stated that he had been a local preacher at Bury. Prisoner was committed for trial, the magistrates accepting the bail of Messrs. George and John Hesketh, cotton spinners, Summerfield, Great Lever, in whose employ the prisoner had formerly been.